"I brought back your gift, Fraulein...or did you think you could pay me?" Joe May directed his first film in 1911, and is perhaps best remembered for giving Fritz Lang some of his first jobs in the business. He fled Germany once the Nazis took power, and he made a handful of B-pictures before his retirement at age 64. I haven't seen any of his other films, but judging from the crfatsmanship shown on Asphalt, it's too bad he didn't get a bigger shot in Hollywood. 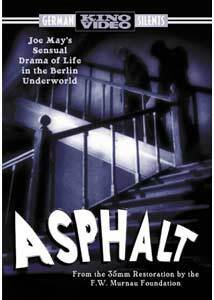 On its face though, much about Asphalt doesn't inspire; the story of a man corrupted by a woman of dubious morality wasn't new in 1929, and there isn't much to the story. May's hand in directing is assured however, and those interested in German silent cinema will likely want to add this to their collection. Albert Holk (Gustav Fr�hlich) is a Berlin cop who lives with his parents; his dad (Albert Steinr�ck) is a cop himself, and mother (Else Heller) dotes on them both. Albert's policing duties as a traffic cop are essentially those of directing traffic like a human stoplight, but we see him good-naturedly carrying out his duty. It seems like the most tedious job a cop could have, but Albert is, if nothing else, dedicated to duty. While on his way home, he happens upon a dispute between Else (Betty Amann) and the owners of a jewelry store, who have accused her of stealing a diamond, an act of which she is guilty. Albert finds the diamond, but Else claims poverty and desperation made her do it. The jewelers are prepared to let her off, but Albert, doing his duty, needs to take her in. Else turns on the feminine wiles on the way to police station, and manages to get Albert to take her home to get her papers, where she proceeds to seduce him. Albert's weakness may have more consequences than he imagined, as Else already has another man. Asphalt, despite the mundane qualities of its plot, makes up for most of its weaknesses with an array of beautiful shots. The opening sequence is magnificent, with the hustle and chaos of the city conveyed via a montage of urban images, which culminates in the ironic peacefulness of a bird in a cage, kept within the apartment of Albert and his parents. As Albert leaves for work, the bird again signals the return to hectic pace of the city, where Albert directs the traffic, which seems ready to burst its flimsy boundaries any second. Another lovely moment comes at the end of Else's seduction of Albert; having literally thrown herself at him, the scene culminates with May's camera angling away from the pair's kiss to a shot of Else's bare foot caressing Albert's booted leg. Some of the parts don't quite add up, though; Else's other boyfriend (Hans Schlettow) is more shoehorned into the plot than anything else, his introduction features a pointless bank break-in sequence before he enters the story. This seems like an area where material might be missing, but perhaps not. His subsequent fight with Albert and its deadly end serves only to move the film to its final plot point, wherein we find out the true depth of the feelings between Albert and Else. not to mention a demonstration of "real duty," via Albert's father, who refuses to act as his son acted in failing to take Else to the police. His first reaction is to get Albert down to the station house. Fr�hlich and Amann are both in fine form, as are the rest of the cast. Image Transfer Review: Asphalt's negative is, so far as is known, long gone, so this version of the film was put together using two different prints, one from Germany and another, longer cut from Russia, and the result looks to be as close as we'll come to the original release version of the film. All that said, it looks okay, with occasional print damage, though nothing that truly detracts from the experience. The transfer is solid, with little to complain about that I could see that wasn't already inherent to the print itself. Some ghosting is visible if you step through frame by frame, but it doesn't interfere with normal viewing and shouldn't be considered a reason to not give this a look. Audio Transfer Review: The score by Karl-Ernst Sasse is solid, and sounds fine here, with no noticeable problems. Extras Review: Nothing beyond chapter selection. Not a deathless classic of the German silent cinema, but an accomplished film nonetheless, finally seeing release thanks to Kino. Extras are nil, but the film's presentation is solid.